With a Lake Trasimeno villa, you will embark on a multi-faceted experience of the things that make Italy such an enjoyable and unforgettable travel destination. Lake Trasimeno is the largest Italian lake south of the Po River, offering views of the lush olive groves, delicate vineyards, and green hills that make this area of Italy so unique. On the west side of the lake, near Tuscany, you may sample the region's voluptuous products, including sweet fruits, and hearty vegetables, and of course wine. Your Lake Trasimeno villa will be a true get-away from the grind of daily life, and you will find that the small nearby towns offer you the best of the local culture with much left to be discovered. Castiglione del Lago boasts the longest shore of any of the towns because it sits on the only prominent peninsula of the lake. Age-old stories suggest that this peninsula was formed by the ancient Romans to link an island to the mainland. Jump in your rental car and hop between these adorable towns. You will find remains of castles spotted throughout the area as well as a crumbling tower near Passignano that gives evidence to the town's historical duty to control the road from Trasimeno to Perugia. A fun day trip from your Lake Trasimeno villa involves taking a boat into the lake and visiting one of the three isles. Isola Maggiore is the only inhabited isle, and it is fun to imagine what this old fishing village looked like in the 14th century, the height of its lifespan. A favorite pastime of both locals and travelers is to sit at a cafe on the shore of the lake, relishing a delicious cone of gelato while singing your favorite tune from the jukebox. Your Lake Trasimeno villa is a treasure chest of relaxation where the only essential task is to watch the sun set over the lake's beautiful waterfront. 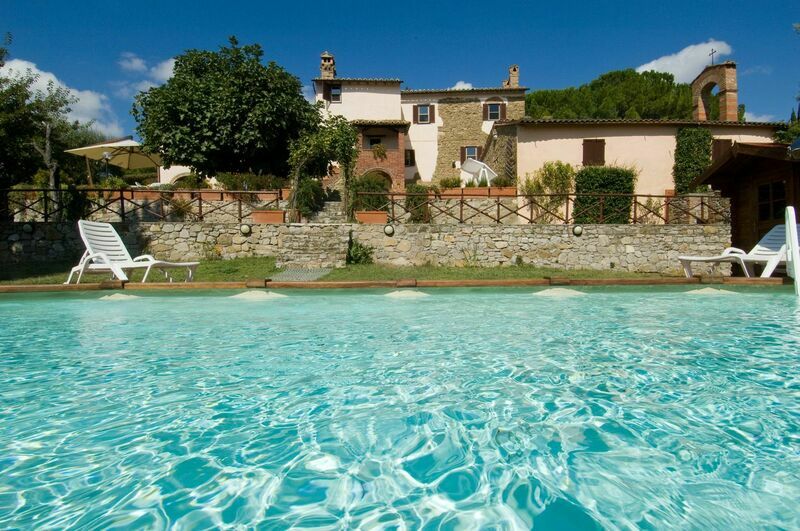 Use our search screen to find your Lake Trasimeno villa rental or apartment - See a list of properties by entering your preferences and travel dates. When you find properties you like, send us an inquiry or reservation request. Want some help from a travel consultant familiar with Lake Trasimeno? Fill out our easy contact form - We have a special love for Umbria because we began our business there. We'd love to respond with our own choices and comments.